Review: Club Monaco Emma Trench. 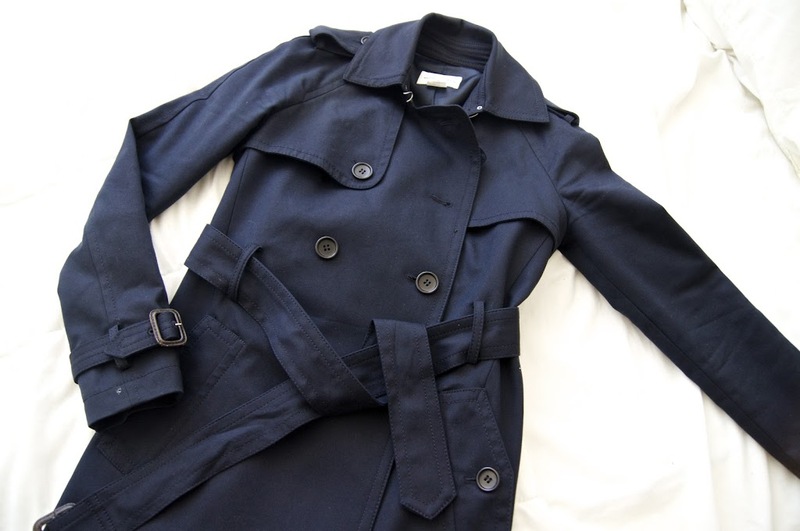 I was asked by a reader to do a review on this Club Monaco Emma Trench you’ve seen me wear quite a few of my more recent posts. I had always intended to write up a post, but I kept putting it on the back burner because as many of my fellow bloggers know, a well-detailed review can be time-consuming to write up. But since someone asked, I’m forced to move it along. Haha. 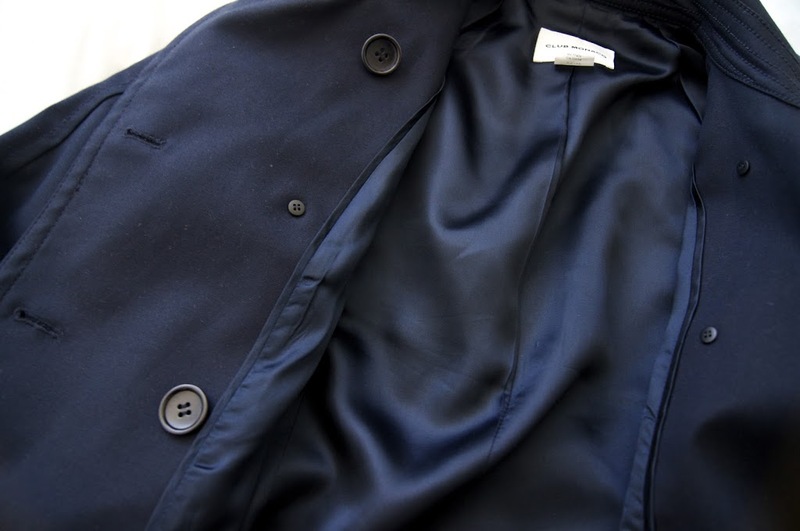 Quality: As you can see, although the lining isn’t silk, it has great durable feel to it, a luxurious feel compared to some polyester linings that you may see in other jackets and blazers. And the construction is impeccable. All seams, buttons, and top-stitching are sewed down tight. Look: What can I say? It looks sharp and well-made. It is thick, so it has a good amount of structure to it–none of that flimsy stuff that you often see from trenches that are unlined or are made from a thinner cotton material. 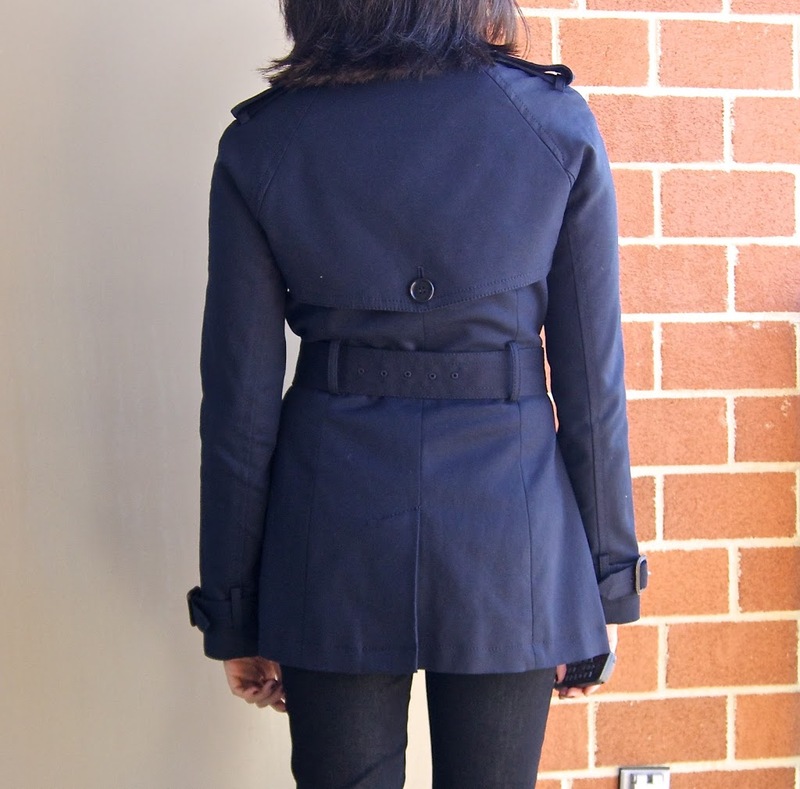 The jacket is double-breasted with two side pockets and has front and back storm flaps with a big hook and eye at the collar. 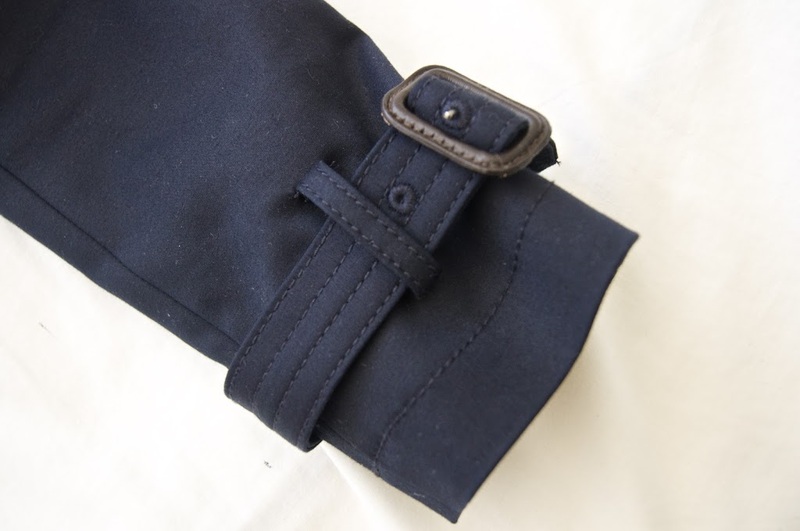 It also has a rear vent and a self-belt that is long and is meant to be tied rather than pulled through the loops (there are no grommets on the waist-belt). Also, note that the buckles are made of leather. Make sure to remove them before you take it to be dry-cleaned! Otherwise, point it out to the dry-cleaner, or the buckles will be ruined. It has a raglan sleeve as opposed to a set-in sleeve, and is topped off with epaulettes typical of military-inspired jackets/trench coats. Overall: I’m completely in love with this trench and I’m super happy with it. I can’t afford a Burberry trench, and although this trench isn’t what one would necessarily call inexpensive, I’m glad that I invested the money into this one. I also love that it is navy instead of black. I find black trench coats to be a little harsh to wear in spring/summer because of the color. 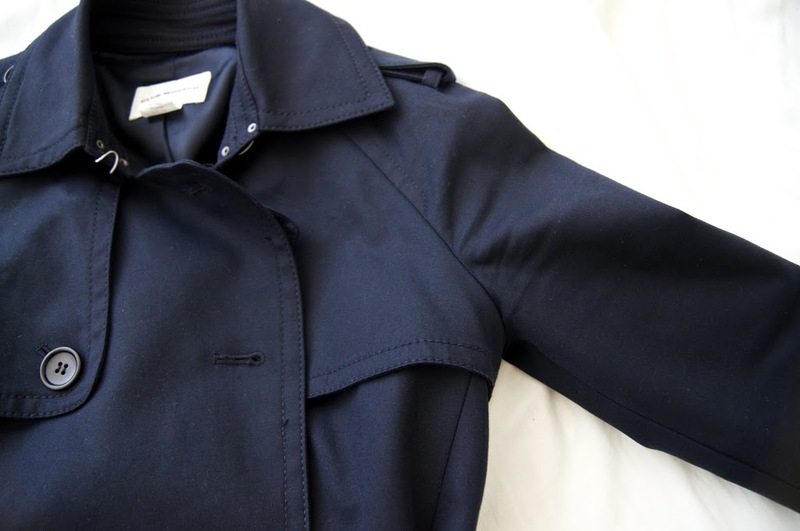 But a navy trench can easily transition from spring/summer to fall/winter. 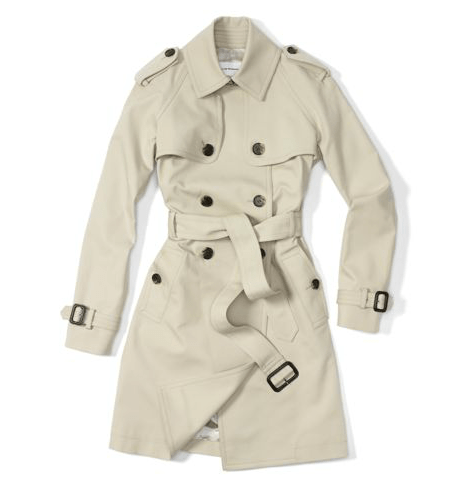 If you prefer a lighter color, it also comes in Khaki Stone, which I haven’t seen myself in stores, but online it appears to be similar to the lighter-colored Burberry trench. Check it out here for $298, and if you have a student card (or active student email) you can get 20% off. 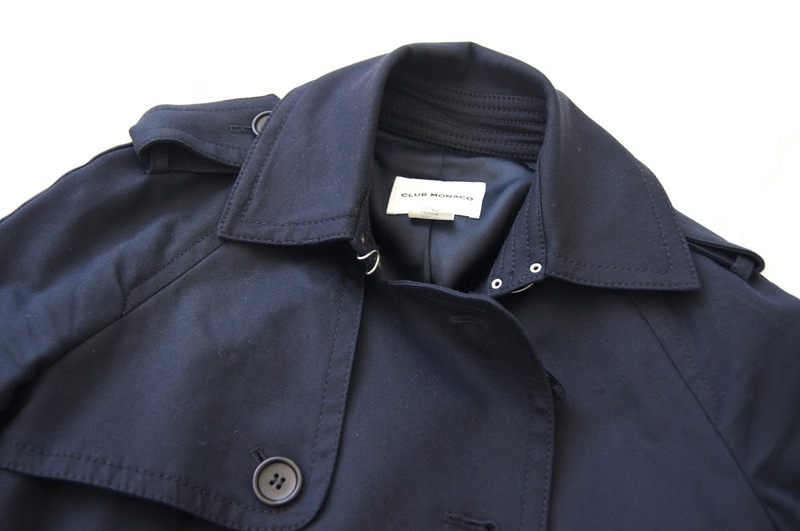 If you are on the market for a good quality trench coat, but are like me and the classic Burberry isn’t quite within your price range, the Club Monaco Emma Trench is worth a look. It will fit great for petites my size and maybe even a little smaller. 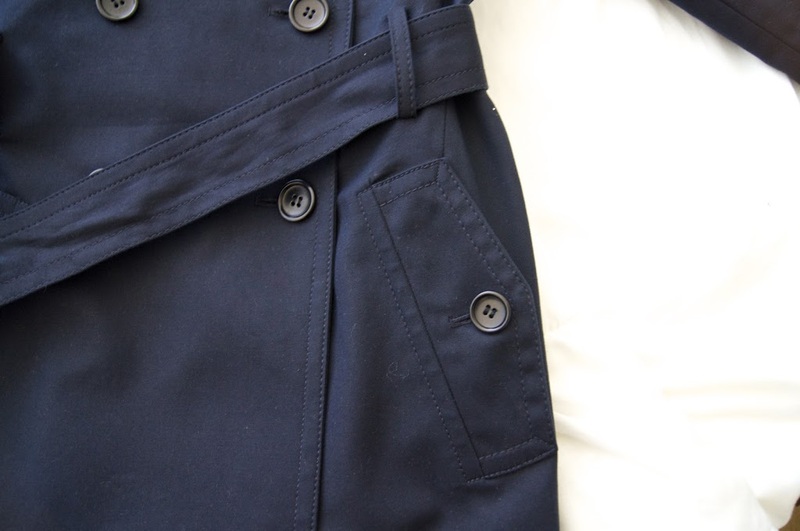 Have you found any other great Burberry-trench alternatives? BTW, Happy Hallowe’en! And I hope everyone on the east coast is safe out there after the storm! It was wet and windy for me but I was lucky enough to be able to watch it all safely from my apartment window and on the TV. I’m thinking of those who weren’t so fortunate. the sleeves are just a tad too long for me. Cher, you look great! The trench fits you really well. It is very nice! Seems like good construction. But it seems shorter than I’d like! It is very nice. What size are you wearing? LOL. I didn’t say?? Geez. I thought i was being thorough. XS! Thanks for sharing great review! That trench looks really good on you. Great buy! I was lucky regarding hurricane. Glad you are too! Yes, the trench certainly looks sharp. And good to know that it has good quality. I like the blue color too. So pretty. That’s a perfect trench! I ordered from CM online and the shipping was super fast too! 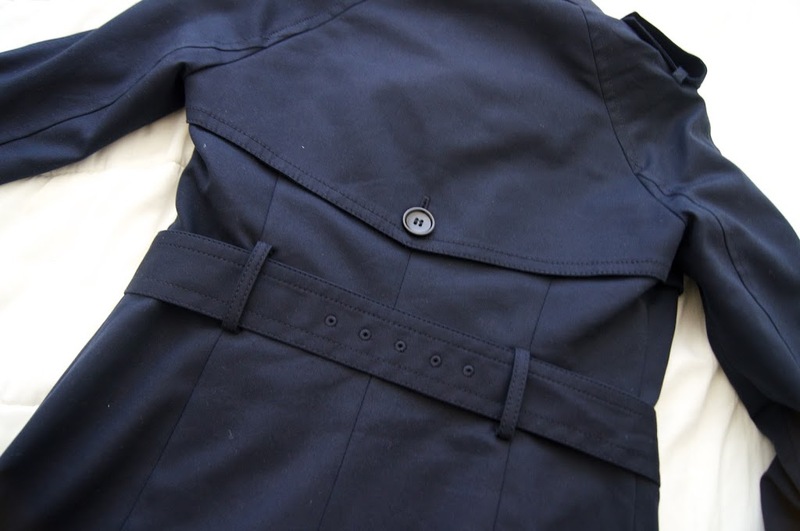 Hi, I came across your blog while searching for a solution – I have this exact coat but silly me took it to the dry cleaners without removing the buckles, and now they’ve been ruined 🙁 I was wondering if you could suggest any ways to fix this, or anywhere I could get a replacement buckle? I’m sorry to hear about your trench! 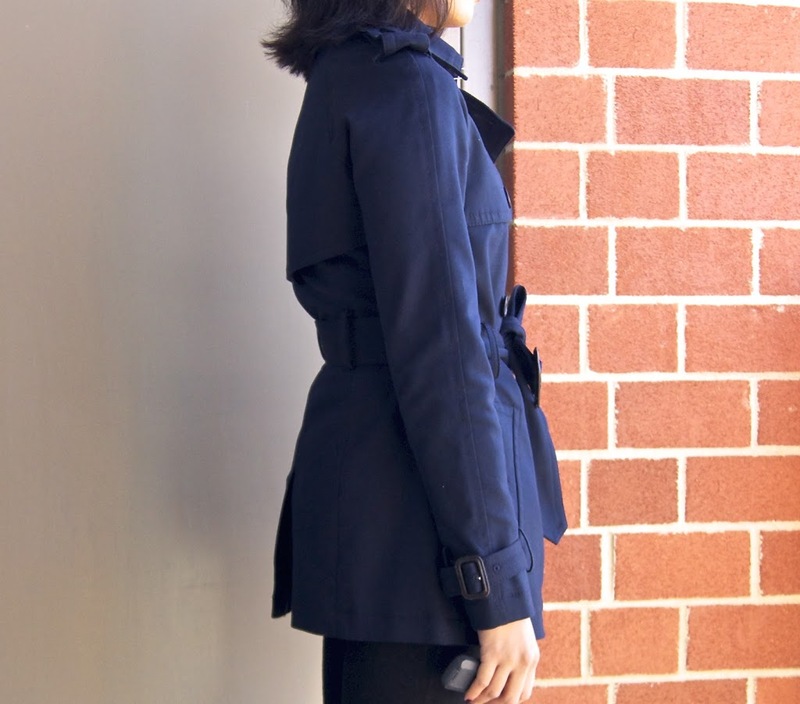 I’ve heard this happen to people, not with the club Monaco trench but with banana republic. Leather just does not do well being dry cleaned unless it is given special treatment. To find replacements I would try specialty sewing stores in your area. I also googled and found a website called atbutton.com that you can order from. They claim to have a wide selection of buckles to choose from. HTH!